The photo at right demonstrates how one ASI member grows his arils and arilbreds in Spain. The ASI webmaster has successfully employed a nearly identical technique for growing arils in Cincinnati, Ohio. The top layer of gravel protects the rhizome from sudden fluctuations in temperature. This is important in spring in Ohio to help prevent the plant from blooming too soon if there's an early warm spell followed by more winter cold. 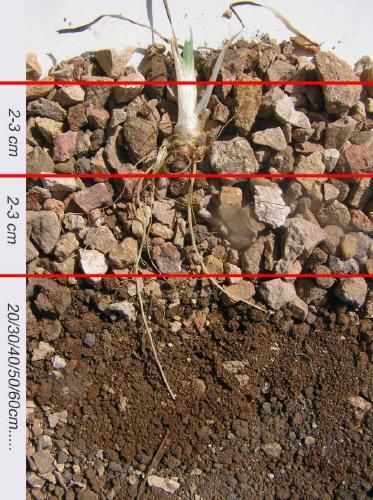 The lower layer of gravel protects the rhizome from excessive moisture. Heavy summer rains can cause arils to rot unless the water is quickly drained away. The roots are easily able to reach nutrients in the soil below. In Eastern USA and Canada, iris borers have the same affinity for arils as other bearded irises. Jean Peyrard has reported from France about a nursery, La Pivoine Bleue, that grows oncocyclus species like Iris iberica with a hydroponic method! The plants are grown in pots with clay globules and irrigated between the months of March and May only. How fasicinating! If you know of any other such cutting edge techniques, please let us know! Photo of aril iris root system by Rafael Diez Dominguez.